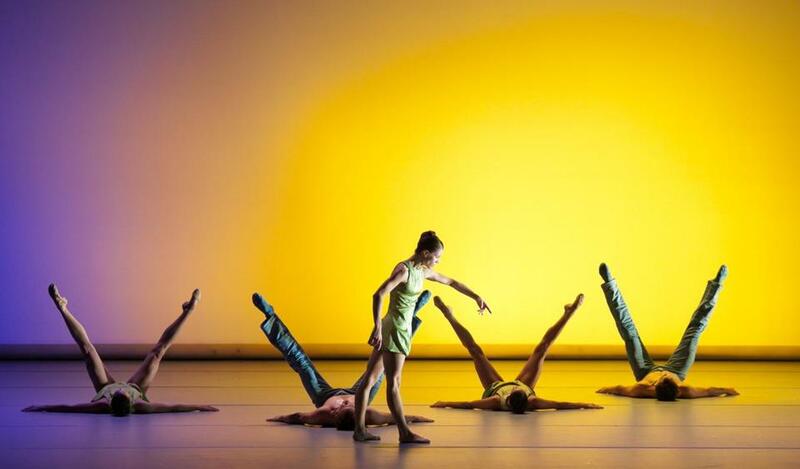 Members of Aspen Santa Fe Ballet in “Over Glow” by Jorma Elo. BECKET — The company bio of the Aspen Santa Fe Ballet notes that in its early days it took advantage of the particular era into which it was born. For this small American ballet troupe, that meant building a crossbred repertoire influenced by bold, experimental work readily seen in Europe, bread-and-butter pieces such as “The Nutcracker,” and a few Balanchine gems. The dancers, therefore, would have to be stylistically flexible movers but strong classicists too. This makeup is now a given in most ballet companies: that European dance aesthetic has been absorbed by choreographers of all stripes. What was once exotic is now expected. And this marvelous company, with its terrific dancers, is, 18 years later, an old master of the hybridization. The catch is that sometimes, as evidenced in the triple bill the company is presenting at Jacob’s Pillow this week (and like the group’s 2011 Pillow visit), the results can look like too much inbreeding. The individual dances are quite strong separately, but seen together they lose a good deal of specialness. In any event, Jorma Elo’s adroit, charming 2011 “Over Glow” deserves its program-opening placement, and our unadulterated attention. The formal grandeur of the score — with music by Beethoven and Mendelssohn — renders Elo’s signature eccentric movements a delightful notch archer than they already are. Undulations ripple, either subtly, in just a hand, or broadly, through a torso; the wiggling is contrasted with crystalline technique, dancers now erect and executing a precisely placed tendu or a beautifully severe fourth position. The genre shifts happen incessantly, and often, with whiplash speed; or Elo creates a hybrid, a soubresaut punched out, with piked legs, rather than straight up. Elo’s choreography excels when his dancers can articulate the shimmies, the delicacies, and the composites — as well as the spaces in between — so that the movements aren’t blurred, but framed. On opening night, the cast of six did just that; they were a tad on edge in the opening but quickly found an equanimity of phrasing; they simply glowed in the enigmatic second section and continued abloom from there. Indeed, one of the company’s main pleasures is the groundedness of these dancers. They move with weight and muscle — creamily, not heavily, with rich confidence — before landing with whispery control. This quality is also key to their excellent, fluid partnering work, much on display throughout the evening. The men, by the way, are more than porters: They are as refined as the women. The other two choreographers on the program, Cayetano Soto and Nicolo Fonte, are also proven talents, and while it’s not unusual that similarities will emerge within generational peers, what’s puzzling is that that which should seem unique — the exaggerated ballet port de bras, say, with the dancers’ fingers tensely shaped, elbows angled rather than softened — is ubiquitous on this program, while movements that are familiar trends — the runs into upright slides, the pitched turns or off-center balances, with one leg to the side, parallel and hip-hiked — become banal in their rampancy here. Fonte’s “The Heart(s)pace,” which premiered earlier this year, and Soto’s 2013 “Beautiful Mistake” (both commissioned by Aspen Santa Fe Ballet), also share likenesses in costuming (different colors, but variations on a theme of high-necked leotards over bare legs) and, somewhat, in their poignant, new-agey scores. This all sounds dismissive, but I don’t mean to be; the differences in stage ambience do help make some distinctions — “Mistake” is somber and shadowy, “Heart(s)pace” is bright and open — yet the myriad of duets, for instance, many of them both acrobatic and intimate, some quite beautiful, muddle later in one’s memory. It’s a company to savor, and I want to savor these dances, too. Just not all at once.